When Oxford College humanities scholar Pablo Palomino decided to teach a University Course this semester exploring “Progress: An Interdisciplinary Reflection,” he expected to engage with a diverse classroom dynamic, working among students representing a wide swath of majors on both Emory’s Oxford and Atlanta campuses. What he didn’t anticipate was that the classroom could go global. For the first time, an Emory University Course is being expanded this semester to include a “Teach-Out” event — a free virtual forum inspired by the “teach-ins” of the 1960s, now offered to global learners through the Coursera online platform. Scheduled to launch April 15, the pilot event invites participants to consider what progress means in the context of public sites of memory and how people may interpret it from different perspectives, explains Stephanie Parisi, associate director of online education at Emory’s Center for Faculty Development and Excellence (CFDE), which is leading the event. The Teach-Out will feature video interviews with people who work in Atlanta addressing topics such as historical sites, neighborhood gentrification and immigrant spaces. It also will include public discussion forums, culminating with an invitation for participants to answer a “call to action” and explore a site of memory in their own community, Parisi says. The idea for hosting the event emerged last spring, when Emory was among 10 schools invited to participate in a Teach-Out Academy offered at the University of Michigan — home of the first “teach-in” in 1965, which was presented as a tool of public education. When Palomino proposed teaching a University Course this spring that examined what “progress” could mean — the history behind the concept, how it is approached by Emory scholars across many disciplines, and how it can be applied in contemporary Atlanta — the CFDE was intrigued. Working with CFDE staff, he found support for expanding the course into an even larger public conversation: a free and open online learning event. “It’s an important topic with philosophical, political and epistemological ramifications, and one that I’ve been thinking of developing as a larger project in the coming years,” says Palomino, assistant professor of Latin American and Caribbean Studies at Oxford College and a Mellon Faculty Fellow in the Humanities, a fellowship designed to foster interdisciplinary connections across Emory’s academic units. Emory launched its first University Course eight years ago with a goal of bringing together undergraduate, graduate and professional students and a robust roster of faculty from across campus for an intensive, multidisciplinary exploration of a common subject. Barbara Coble, partnerships manager of Graduation Generation, talking about gentrification in the Edgewood and Kirkwood neighborhoods. Gabrielle Dudley, instruction archivist in the Stuart A. Rose Manuscript, Archives and Rare Book Library, discussing approaches to researching and capturing sites of memory. Michael Bradley, professor of philosophy/religion at Georgia State University, talking about his research on Stone Mountain. 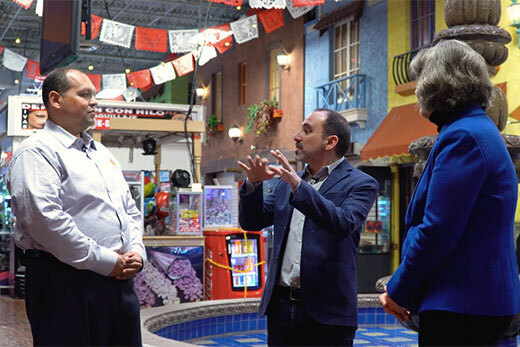 Vialla Hartfield-Mendez, professor of Spanish, and Julio Penaranda, general manager of Plaza Fiesta, talking about the plaza as a place of memory for the local LatinX population. Through the University Course, Palomino’s students will also participate in the Teach-Out, helping facilitate online discussions and developing their own “call to action” projects, Palomino says. The community learning event also fits well within the pillars of the One Emory strategic framework, reflecting the university’s commitment to engage local and global communities while highlighting the scholarship of faculty experts, notes Donna Troka, CFDE senior associate director. “We thought this was a topic that had real reach and would definitely be meaningful to global learners,” she says. Once launched, the Teach-Out will run for two weeks and may be accessed at the convenience of participants. To join the online event, enroll here. For more information about this program, visit the CFDE website.